Today, developer Novaquark decided to showcase their innovative voxel engine that lets players build the universe of their Sci-fi fantasies. Hence, we have new footage for Dual Universe, the shared sandbox experience of terraforming and colonization. Devs have been on a tour of exposition detailing the nuance to Dual Universe’s sandbox experience, what makes it unique – Through the use of an uncompromising voxel engine, players have the power to build on and edit the endless world around them. However, Novaquark wanted to share more, and they have provided a trailer that better demonstrates some of the literal world-building aspects. And keep in mind, everything you see has been done on a shared plane. Dual Universe has neither separate servers nor loading screens. Whether they’re building a single structure on a small scale or working together to forge an entirely new civilization on a massive scale, Dual Universe’s tools empower players to build however they want. Novaquark simply sets the rules and establishes the universe, but everything that grows, falls, is rebuilt, and shared within this universe is and will always be a community-constructed endeavor. 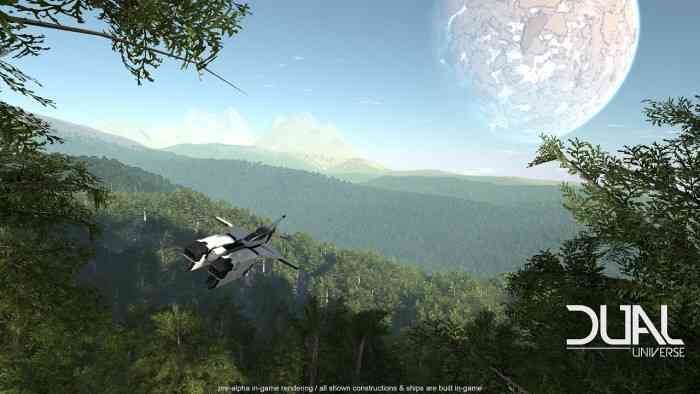 While the term “voxel” tends to evoke images of cube-shaped building blocks, Dual Universe delivers a proprietary voxel engine that affords players much more control in manipulating the world – and universe – around them. At a simple level, players can place and manipulate fully editable blocks that come in all shapes and sizes as they build canyon-filling cities or spaceship fleets. For players who want to get a little more granular, this voxel engine allows them to terraform at will, carving away at a planet’s surface, and digging complex cave systems that could one day house an organization’s base of operations. Without understating the capacity of Dual Universe’s shared world, you might say the game is like an infinitely cooperative Minecraft. Except, the IP offers life-like visuals even in its Pre-Alpha stage. Speaking of which, players who aid in crowdfunding will gain early access to the game’s endless offerings. One Support Pack grants immediate on top of perks, and you can find them on the official website here. Check back for updates as Dual Universe reaches new milestones in development.